Stack 'em three high with this easy pancake recipe! While the griddle is preheating on medium heat, mix the eggs and liquids in a large bowl. 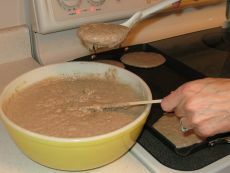 Add the baking powder to the bag of pancake mix and stir in well. 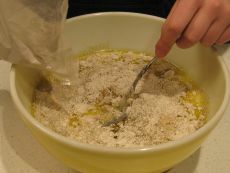 Add the whole bag to the eggs, milk/water, and oil mixture and mix until blended. 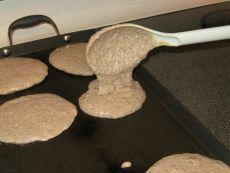 Add a tablespoon of oil to the griddle and spoon out your pancakes. Put the four end ones on the griddle first. 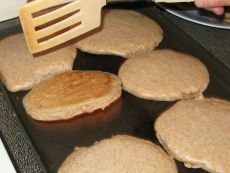 (The ends of the griddle are not as hot, so this allows them to get done at the same time.) Adjust your heat lower if necessary. We turn it to "2". Cook on one side until bubbles form on the edges, then flip and cook on the other side until golden brown. We took this picture right in the middle of the flip! 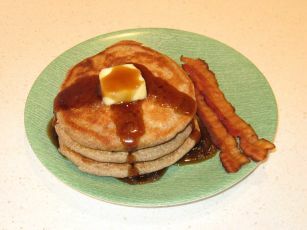 Now, top with your favorite syrup, honey, or jam and dig in! This recipe makes 32 pancakes. The griddle allows you to cook 8 at once. Freeze the left-overs and heat them in the toaster. They're great! For a variation try adding something to half of the batter to see if you like it...maybe some coconut, chocolate chips, berries, or nuts. Go ahead, be adventurous!